With the strategic support of Cisco, partners like Living Goods and Opportunity International make it possible for people to break the cycle of poverty for themselves and for their communities through new uses of data and technology. But those solutions — more common than ever in today’s digital economy — aren’t always equitably accessible to one of our largest populations — women. Women in developing countries are less likely than men to have access to and use financial services, which is one of the problems poverty-focused organizations are working to solve. 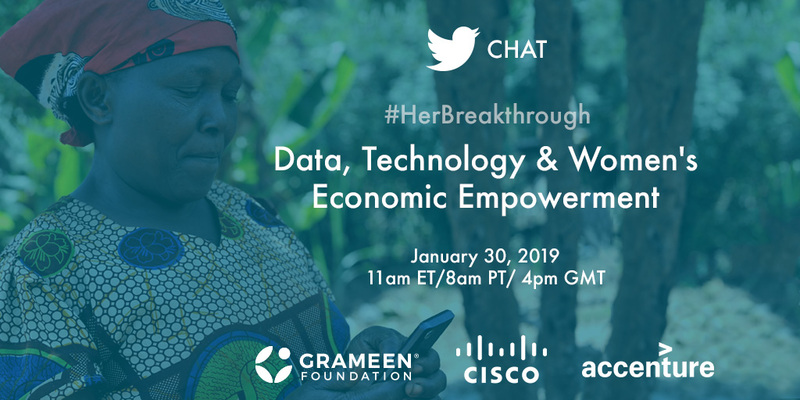 Next week, I’ll join the Grameen Foundation and Accenture on Twitter to discuss just how we can use data and technology to improve women’s lives. Join us on Wednesday, January 30th at 8 am PT to engage in the conversation. Before we take to social media, I’d like to share how Cisco is partnering with organizations to empower women around the world. What were the key breakthroughs in using data and tech to improve women’s economic empowerment in 2018? With improvements in the speed and volume of data collection, organizations are able to analyze data in nearly real-time, which can facilitate rapid response. With this data, they gain intelligence and insights into who they’re actually reaching through their economic empowerment initiatives, how clients are using technology, and how technology is empowering women. They can then use this data to refine existing initiatives, inform the design and implementation of new initiatives, and better segment and target client populations. One example of this breakthrough in action is our partner, Living Goods, which provides livelihood opportunities to (predominantly female) Community Health Workers (CHWs) who deliver health education and products to low-income women and families in Africa. With Cisco support, they developed a mobile-enabled, cloud-backed platform that is now the backbone of their operations — providing insights into their business operations, CHW performance, and beneficiary impact. These capabilities have enabled Living Goods to rapidly scale their reach to more beneficiaries; their goal is to reach 25 million people across four countries via 34,000 CHWs by 2021. They are now using data and technology in other new and innovative ways, including developing predictive algorithms to identify risks, target interventions, and direct resources to high priority areas to maximize impact. How can data and technology be better harnessed to serve low-income and poor women? At Cisco, we believe that technology is a great equalizer. It not only enables equal access but, importantly, equitable access. Technology can be used to provide access to resources that facilitate independence, empowerment, and ultimately, economic self-sufficiency. The ability to collect, validate, and analyze large amounts of data in real-time provides valuable insights that can be used to design and deliver tech-based interventions targeting low-income women. Our partner, Opportunity International (Opportunity), is leveraging digitization to provide access to financial products and services to un- and underbanked populations, enabling low-income populations to equitably access banking services. Beyond providing access, they are using data to better understand their clients’ needs, what is working and what is not, and the impact of their digital financial interventions. Through their research, Opportunity found that when women feel comfortable using digital financial products and services, they feel empowered. Having their own bank account provides financial security, control, and independence. Thus, women are able to transact privately, securely, and independently because they can transact when they want, and more importantly, how they want. We know that women invest in their families, which drives long-term outcomes for themselves and their children. Opportunity also is using these data insights to inform the design and implementation of new types of digital financial products and services, and to better target client groups — including rural women, ultra-poor women, elderly women, and more. How can we improve the use of technology for economic empowerment by low-income women? As we know, technology is an enabler that can drive both the scale and depth of impact. But we also know that women do not have equal and equitable access to technology. The key is to design technology that provides both equitable access and that addresses the particular issues low-income women face in accessing, adopting, and fully using technology. One example from the financial sector is female access to fair and affordable credit to start businesses or meet basic needs. Our partner Kiva’s technology-enabled, peer-to-peer lending platform has facilitated more than 3 million loans to low-income populations across 80 countries, 80% of whom are women. Thanks to Kiva, women have been able to start and maintain businesses, send their children to school, and build strong families — improving their own lives as well as those of their families and communities. What should we consider in designing products and services to be delivered by female agents? We should start by applying a design thinking framework to deeply and thoughtfully consider the unique characteristics of both the female agents delivering the products and services, as well as the population being targeted. Empathy is the centerpiece of human-centered design thinking, which means understanding who clients (both female agents and beneficiaries in this case) are, how they do things and why, their priorities, as well as their needs. This may mean specific considerations to engage female agents in the design process to ensure that they too will find the products and services they are delivering useful, understand and address how female agents will best learn about the products and services to be delivered, how they communicate with their target beneficiaries, and how beneficiaries will use the products and services. For example, female agents may have more in-depth, frequent, and personal communication with their beneficiaries. This will impact how products and services are designed and delivered. From the empathy phase, the next phase is to define the challenge, then ideate a broad range of solutions, develop prototypes, and finally test the solutions. Cisco partner Living Goods considers both the agents who deliver their solutions, as well as the beneficiary population using the solutions. They deeply engage with and train their agents, who then deliver Living Goods products and services on the front lines.